I have been hiking and backpacking for many years and spent many a day hiking in the rain. I remember the days before I got my first waterproof breathable jacket. Back when Goretex was your only choice and your only alternative was polyurethane coated nylon. I remember spending multiple days backpacking through central Oregon in a rainstorm. All I had was one of those old nylon ponchos. It would whip around in the wind blocking my view of the trail and otherwise cause what I thought at the time to be such inconveniences. Those were the days when I still had an external frame pack. One of the things my poncho did well was to drape over my pack and not only keep me dry, but my pack as well. When I finally graduated to the place where I could afford that first Goretex jacket I thought nothing would be better. What I discovered was that instead of solving a problem I inherited a new one. My pack which used to be protected by my poncho was now out there exposed to the elements. At the time the solution was a pack cover. Pack covers worked because the external frame of the pack created a nice hump that the cover could drape over. Not only that but my external frame pack had a couple of mesh panels that kept my back away for the cold aluminum frame and allowed the back of my new waterproof breathable jacket to breathe. All was well and the system worked great for a number of years until I again updated my gear, this time replacing my old worn-out external frame pack with a close-fitting internal pack. The comfort of my new pack and the stability of my loaded pack far outweighed the wobbliness of my old pack. I could now travel cross country, off-trail without feeling that my pack was trying to pull me into the nearest gorse bush or topple me into the stream while crossing on a log. The problem appeared when I was out on a trip and it began to rain. I pulled out my pack cover and tried to cover my pack. I found that no matter what I tried, the design of my new pack made it impossible to cover the top, especially around the shoulder straps, since they connected to the pack at the top. So even though most of my pack was covered, the top, where most of the rain hit it, was exposed. I found that my jacket, squeezed tightly against my pack, even though technically waterproof-breathable, did not breathe, and water would drip down my back and soggify my shorts. Not only would I be wet, but now my pack would collect water and I had to be concerned and plan how to keep water away from my gear with additional bags. The most effective being a trash compactor bag lining the inside of my entire pack. There had to be a better way. As I began to think the problem through it became evident that I needed a way to keep the rain from coming between me and my pack. I could either get a jacket big enough to wear over my pack, or I could perhaps consider returning to my past and reinvestigating using a poncho. I have been using a Marmot Precip rain jacket for a number of years. At 14.3 ounces, it was one of the lightest waterproof-breathable jackets you could get back when I bought it. Since then Outdoor Research has introduced the Helium II with a weight of only 6.4 ounces. 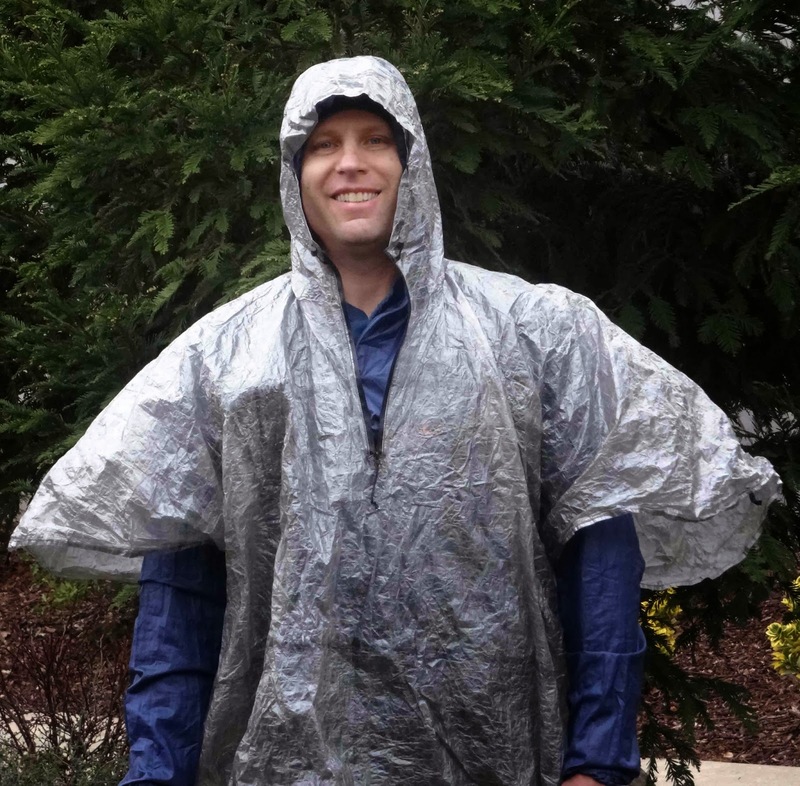 My thought was that if I where to replace my Precip with a Helium II I would have 7.9 ounces available for a lightweight poncho. 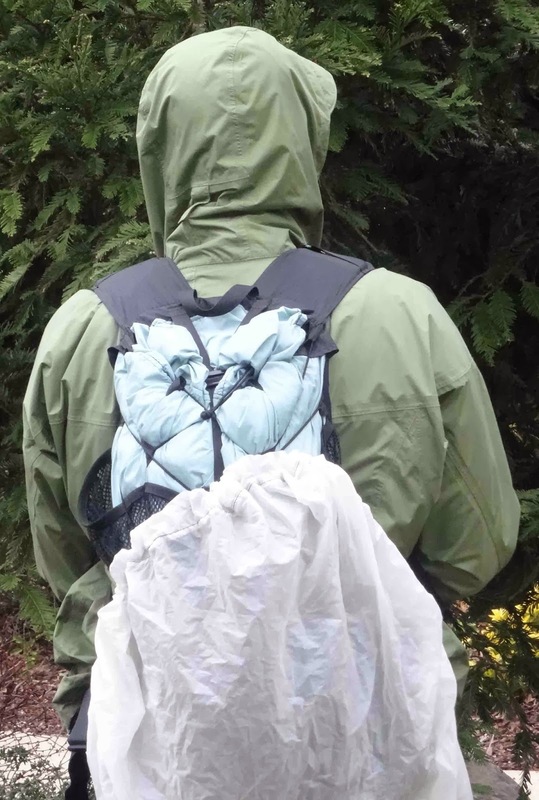 So I searched for a poncho that was within that weight and found the ZPacks groundsheet poncho is only 5.1 ounces. 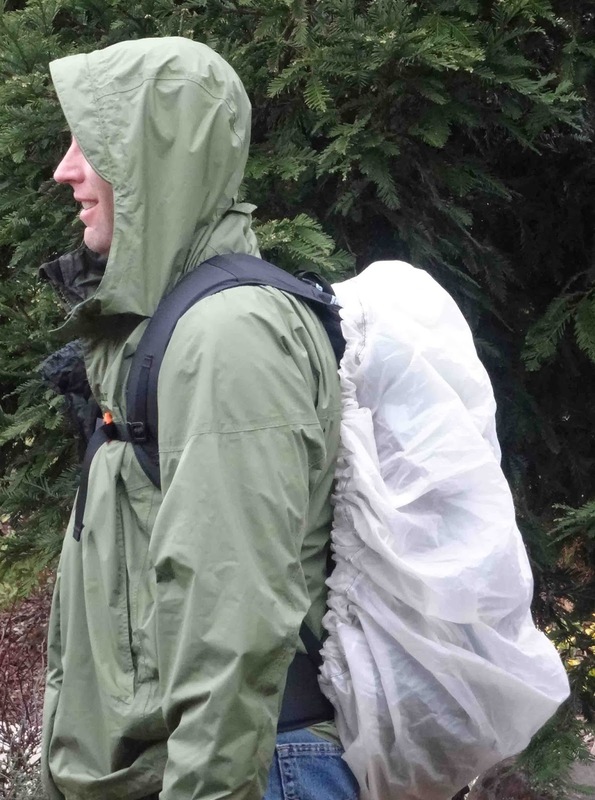 Switching from my Precip to the combination of a Helium II and the ZPacks groundsheet poncho would not only lighten my load, more importantly it could solve the soggy underpants dilemma. 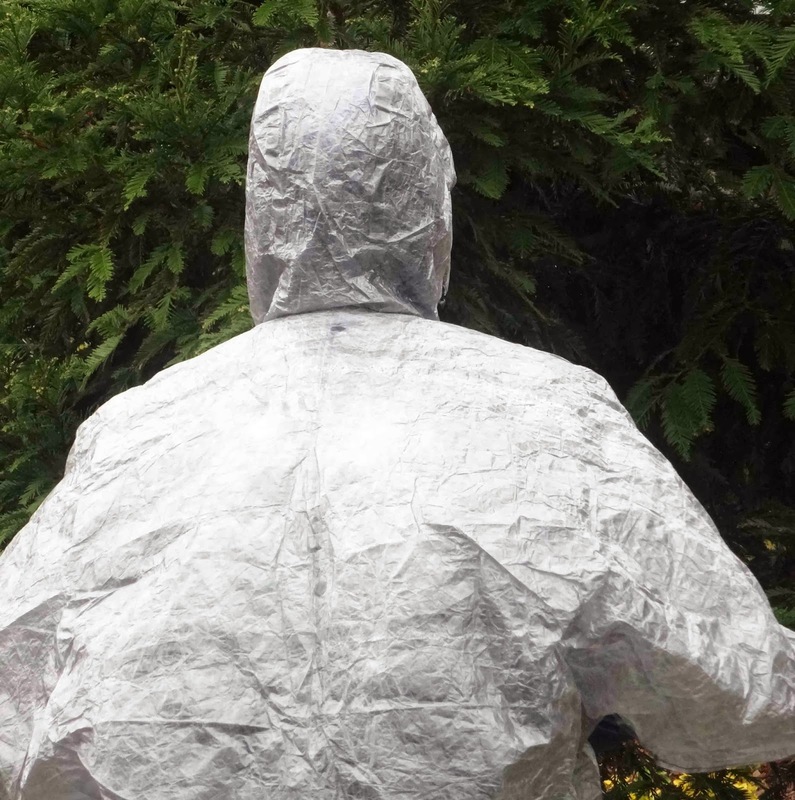 I really like the features of the ZPacks groundsheet poncho though I don't think I will ever use it as a groundsheet. I have a hard time taking something that I want to remain waterproof and put it between me and the ground with all of the sharp twigs, rocks, and pinecones that seem to inhabit the floor of my campsites. Rain protection - packcover versus poncho, poncho wins! You look like you have football pads on! 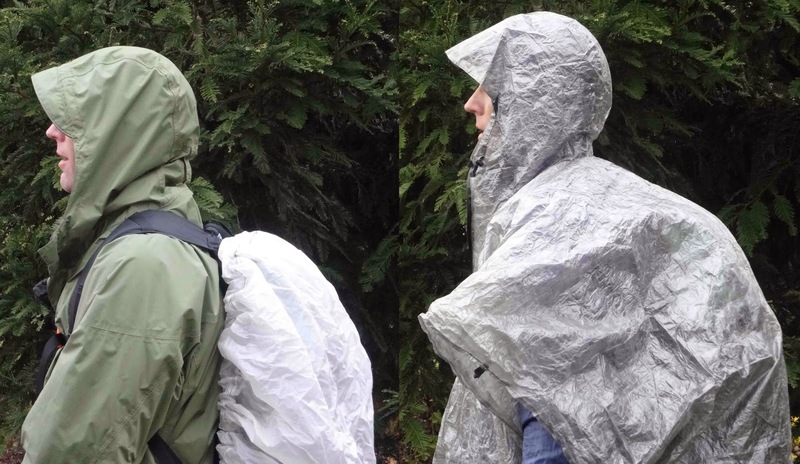 Lightweight hikers like myself are obsessed with the idea of dual use gear so the idea of carrying a poncho just for use as a poncho doesn't sound as useful as something that could double as a groundsheet too. However I will probably never use it that way. As for dual-use, I think of it as a poncho and pack-cover. I really like the design, especially the water resistant zippers. The most annoying thing that I remember about my previous ponchos was the way they would whip around in a stiff breeze. I think the zippers will go along way to keep me covered and the whipping to a minimum. I have not had a chance to fully test my new combination on a real trip in the woods yet, but my preliminary test hikes around town have proven the value and concept. I have found that if there isn't any wind you really don't need to have a rain jacket at all. The sides of the poncho are more than adequate to protect your shoulders and upper arms from the rain. And the best part is that my pack and undershorts were still dry at the end of my test hike.